Preheat the grill. 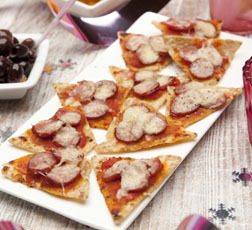 Top large whole corn chips with teaspoons of pizza or pasta sauce, thin slices of sausage and small pieces of Cheddar cheese. Arrange on a baking tray and grill until the cheese just starts to soften. Arrange on serving plates and eat whilst still warm. If they start to cool off, just pop them under the grill to reheat them, watching that they don’t burn. Help save the environment simply by wasting less food. Research shows over 60% of us, as shoppers, are concerned about the environmental impact of our food and groceries.